As fellow seaman we thought that we should give you a little bit of insight information about buying a yacht, especially if you are first timer considering to be a yacht owner. Please take it easy and have a closer look at the hull material and the craftmanship of the interior. İf you are not sure about what you are doing then please take an experienced captain or an expert with you in order to make sure you dont get into trouble with an orange box…! Either a Turkish gulet or a custom built motoryacht, every yachts for sale would have a buyer but the most important issue is for you to decide what is most convenient for you, since there are important points such as what is your intention with this yacht ? private use or commercial ? how many cabins you need in order to accomodate a small family or a large group. 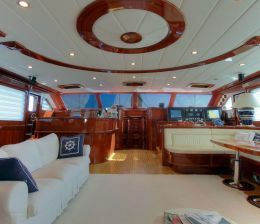 which means the world of yacht for sale are at your disposition with a Global Yachts for sale Brokerage network. What we know about ships, stability calculations, shearing forces and bending moments as well as yacht building, boats and crewed yacht charter business is our on hand experience, we always give our best try to be the best in the market because we are prepared and able to undertake any project and do it with best possible materials with the highest cutting edge technologies, glossy finished craftmanship and professional performance . we can offer you the whole thing as concentrated as possible to satisfy your thirst to build a splendid gulet and have your loved ones and your guests enjoy the utmost luxury and comfort on board your private, floating residence. we hope to be remembered as the good guys. One has to learn many different issues before deciding on yachts for sale either motor yacht, sailing yacht or a Turkish gulet in order to avoid serious mistakes which may cause huge losses of precious time and money. Then a professional yacht supervisor or an experienced captain from a broker agent should be evaluating the boat before you sit down to negotiate the final price with the owner to avoid unpleasant surprises and extra expenses for refitting and or repair expenses. we can help you evaluate the yacht with a professional, independent surveyor even before you see the boat physically and avoid unnecessary travels that we can tell you in advance whether the yachts for sale you are interested is worthed your money or not even to consider it.